Good afternoon from Huntington Beach everyone! I’m about to head out for a consultation & wanted to share a very exciting moment in my life. Recently the PPA (Professional Photographers Of America) reached out to me to see if I had a special couple that I had the honour of working with that they could interview. The basis of their article was to share with other brides and grooms why it’s important to hire a professional photographer for their wedding. Having been on both sides of that fence being a professional photographer and having had my own wedding as well. The PPA had a terrific chat with Anna Marie about her experience with me for their Los Olivos Wedding at the Firestone Vineyard that I had the honour of being a part of back in October last year. 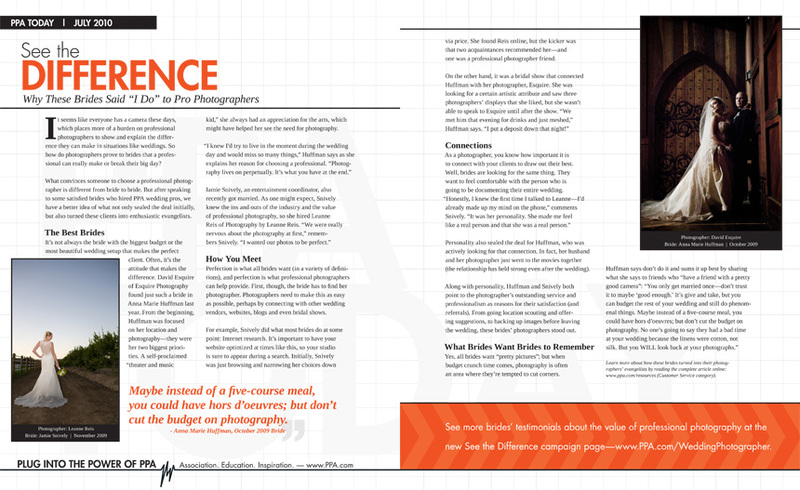 And as fate would have it, the PPA decided to use Anna’s interview in the upcoming issue in July. I’ve included a copy of the tear sheet that I received this afternoon, but definitely feel free to enjoy the article on the PPA’s Website as well. If you’re a PPA Professional Photographer, just use your login credentials or you can register to read the full article. But before you check out the interview with Anna Marie about the importance of hiring a professional photographer, and you’re thinking to yourself… Hey – I’d really like to get to know this Orange County Wedding Photographer in Huntington Beach, California that shoots weddings all over from OC to LA to Ventura and up at the Firestone Vineyard in Los Olivos. Feel free to contact me anytime. I hope you are having a great Baby Friday & stay tuned for some delicious photography from Lizelle & Kevin’s wedding I had the honour of photographing on a yacht up in Marina Del Rey – cheers! PS, you may recognize the beautiful photo of Anna Marie in the article because Anna Marie is blowing a delicious kiss in a photo in my header slide show on top of my website.